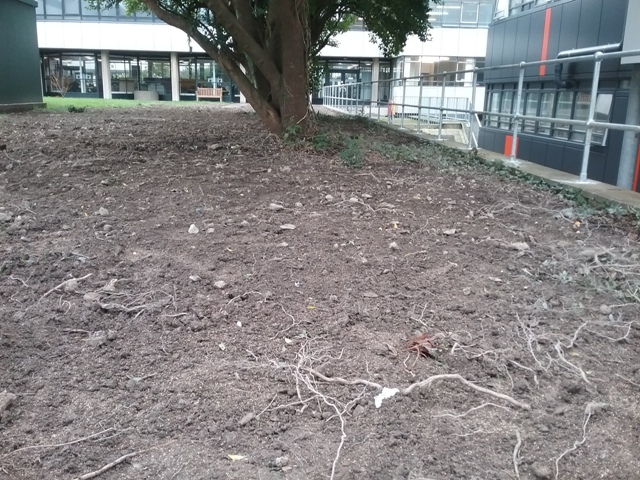 Early last month I lamented the loss of the shrub planting below the Hugh Owen building. Never have I had so many readers, 1600 within 24 hours of posting, and the cries of anguish echoed far and wide. But the destruction continues. Gardening, according to the Aberystwyth Estates Department, is an activity best performed with a mechanical digger. In the last two weeks whole shrub borders have scraped from the ground. 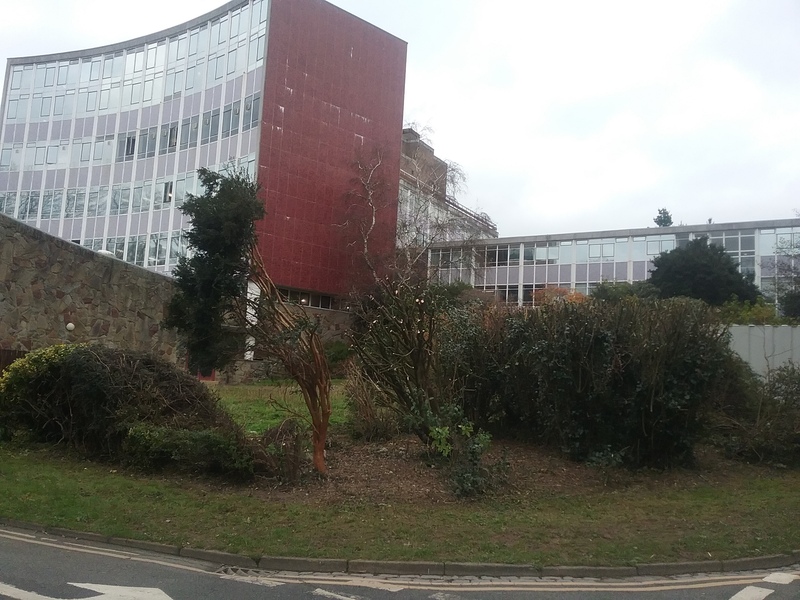 Adjoining the Student Welcome Centre were three trees, two phyllyrea and a griselinia, and a border of hydrangea, fuchsia, escallonia and evergreen olearia species. Now only the trees remain. The border has been grubbed out entirely. Viewed from the Llandinam concourse there is little to see now, but an unkempt lawn with a circular bed containing a dead tree, and, beyond it, a large green painted metal box. The border needed some weeding and maintenance it is true, but it formed a handsome screen at the top of a concrete retaining wall outside the Llandinam building concourse. 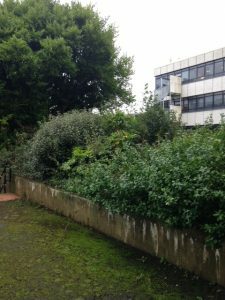 Where the steps lead down towards the Cledwyn building, a broad swathe of ground hugging cotoneaster and vinca on either side of the descent was badly invaded by brambles. A gardener might have dug these out, or cut them and poisoned the stumps. 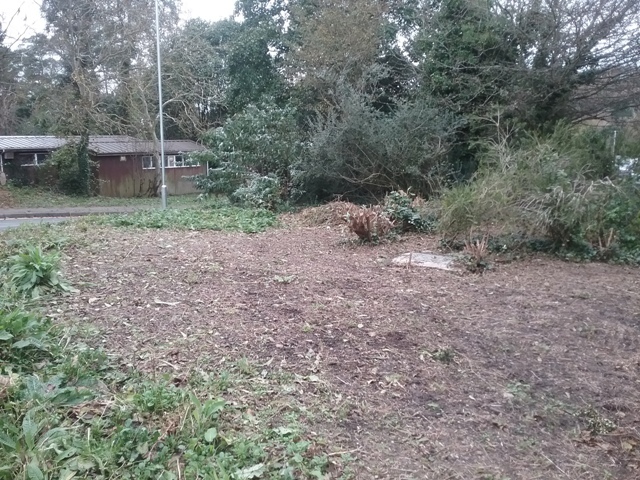 Instead a few hours with a digger have obliterated the lot, and the bramble roots will be the first to recover in the broken earth. Formerly a bank clothed in prostrate and low growing cotoneaster? Further down, the iconic view of the terracotta-coloured end of the Physical Sciences building is framed by some freshly mangled trees, chopped off at some 8 feet above ground. 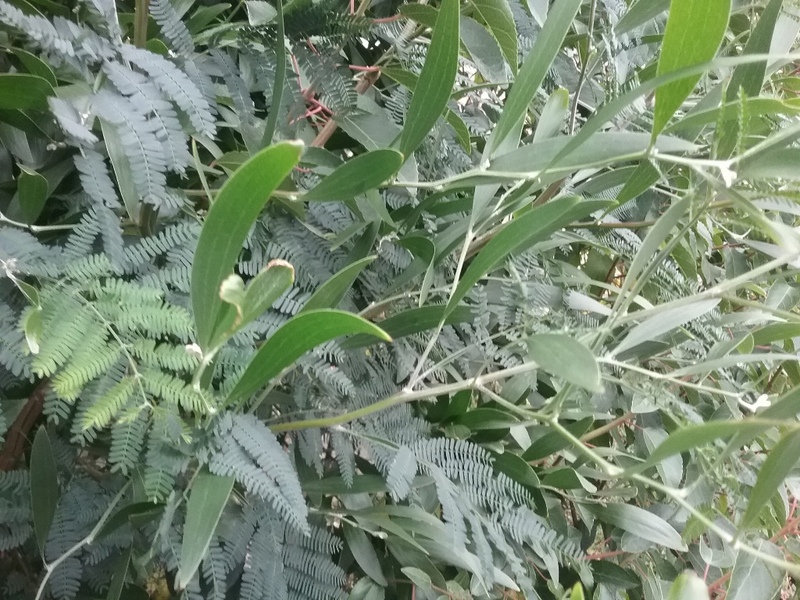 A distorted, one-sided Myrtle, Luma apiculata reaching over to the left (one of many seedlings on the campus), echoes the space formerly occupied by a large cotoneaster and a purple berberis beside it. This was all looking quite tidy as a group at the beginning of the month, though it adjoined a building site. Now the designed planting has been hacked away, and the accidental incomer has been preserved. It was the same below the Hugh Owen, where randomly spared trees include self seeded willow and ash. There is some fine planting further up the slope on the terrace leading to the Physics entrance. I wonder whether that will survive. 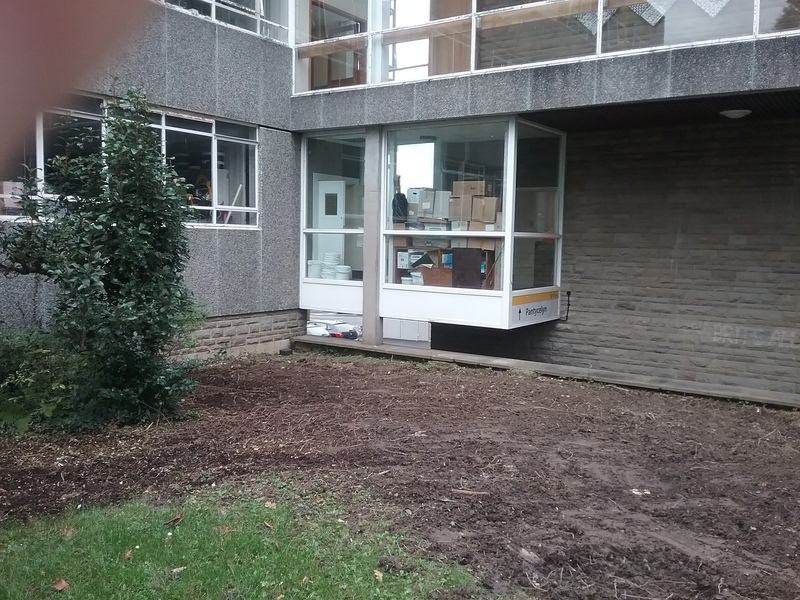 The triangular bed at the west end of the Biology building used to contain big evergreen daisy bushes Olearia avicenniifolia. This tender New Zealand species first came to Tresco in the Scilly islands in 1914 and according to the RHS Plantfinder is available at just one nursery in the UK today. It’s gone. But we get a marvellously unimpeded view of the connecting glass corridor which seems function principally as a box store. Adjoining the end of the building was a Crinodendron hookerianum, the Chilean Lantern Tree, approaching its mature height of 20 feet. This slow-growing narrow tree dangles fleshy crimson flowers about an inch long from summer till autumn. It has had its top cut off, though an adjoining dead tree cloaked in ivy has been spared. Continuing down the road between the Sports building and Biological Sciences, the corner has been cleared to display a few stumps and a manhole cover. The metre-wide strip adjoining the road was cleared back a year ago and has been seeded with teasels and foxgloves which will look quite pretty next spring. Not for long though. Foxgloves are biennial, so the current crop will die next summer, and dock and creeping buttercup will take their place. Soon we can call this teasel corner. The hackers and diggers may be there soon too, destroying more botanical heritage. There is also a Hoheria sexstylosa nearby, a rare Berberis and another rare daisy bush Olearia rotundifolia flourishing far from its native habitat the southern alps of South Island, New Zealand. The list could go on. But no-one making the decisions about the contractors’ actions seems to know or care about plants. I doubt any future planting will be more than commonplace. My final picture is of one of the recently completed works. 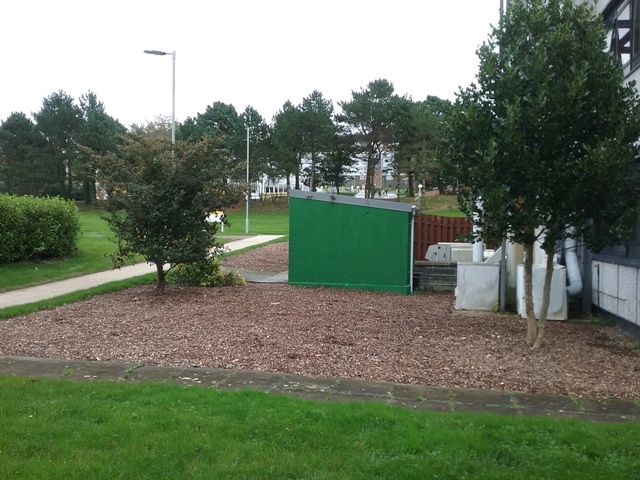 An extensive border was removed and bark chippings laid to frame these unattractive pipes and utility sheds beside an arterial path to the Student Welcome Centre. The is not the style for which the gardens were listed Grade II* by Cadw just fifteen years ago. 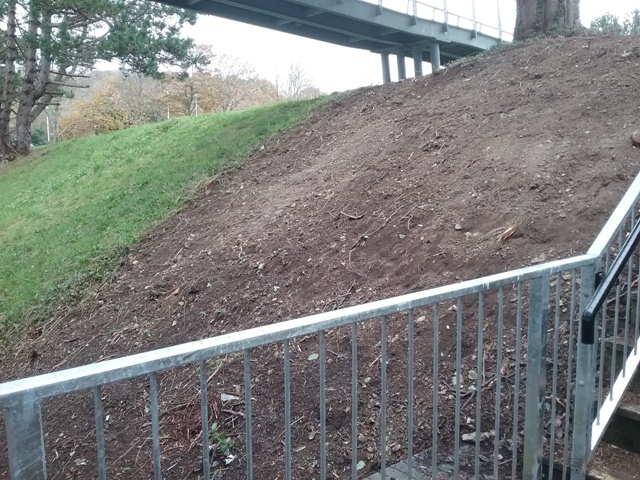 This entry was posted in Ceredigion present, Parks and Gardens, Plants, Rants and tagged Aberystwyth University, Penglais campus by Curious Scribbler. Bookmark the permalink. Oh dear, my late father would be so angry, he was an avid botanist and physicist in the uni back in the 1960’s. Such a shame that with a bit more thought a bit of thoughtful and careful clearing would have saved these plants and trees . I wonder what’s going in their place , a load of concrete?? I’m sure Professor Wareing and Basil Fox would be very sad to see what’s happening to the campus they took such great care over. As a member of staff I cannot recall being consulted on the plan, but it looks very good on the University website. I believe the VC is soon to be taken on a guided tour of the Plas Gogerddan estate, another of the University’s heritage assets. I understand this new working group has yet to meet and form a plan. remarkable; no corner is left unplanted, mainly with evergreen shrubs and conifers. 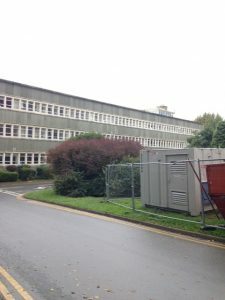 “The Welsh Historic Gardens Trust is working with Aberystwyth University in a new partnership to develop a long-term conservation plan for the Penglais campus grounds. As well as the Trust, the group will include Estates Department staff and the University’s own botanical experts.